Those "planet saviors" who hate fossil fuels a lot then use lots of fossil fuels as they fly from one big city to another worldwide, hahaha. Joker-hypocrites. On average, the big annual UN FCCC conference attracts about 20,000 climate negotiators, climate lenders, planet saviors, environmental do-gooders, watermelon activists (green outside, red inside) outright socialists and communists, etc. MSNBC anchor Chris Hayes’ admission that climate change is a “ratings killer” has infuriated environmentalists who accused the liberal network of being more concerned about its bottom line than with fighting global warming. 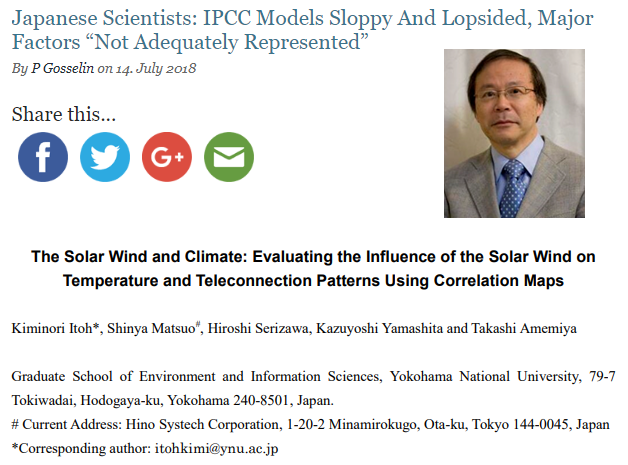 And this story from an Asian scientist. * This is my article in today's BusinessWorld 31st Anniversary special issue, "The Changing Game", S7 page 2. That statement from one of the world’s famous classical liberals is the early seed of monetary explanation for inflation. David Ricardo, known for his free trade theory of comparative advantage and the labor theory of value, argued that greater output can only come from greater savings and investment, not from greater quantity of money being put into circulation by governments. Fast forward two centuries, monetary policies by many governments to tweak their local interest rate, exchange rate and inflation rate are done more often. The Philippines experienced high inflation in January 2018 (4.0%) vs December 2017 (3.3%). TRAIN bill became a law in December 2017. And the inflation rate kept rising until May 2018 and public dissatisfaction keeps rising too. “With a running average of 2.8%, the Duterte Administration’s inflation rate is well below the 6.3 % average of the past five administrations. That is a deceptive campaign by the DOF and give high credit to Dutertenomics. Asiawide or worldwide, inflation rates are declining in many countries from the 70s and 80s. Interest rates too are declining, GDP size of countries are rising. So almost all recent administrations in many countries can claim or grab credit for themselves what are actually global phenomenon. Canada’s Trudeau, USA’s Trump, Australia’s Turnbull, UK’s May, Germany’s Merkel, Japan’s Abe, Taiwan’s Tsai, South Korea’s Moon, China’s Xi and HK’s Lam can also brag that inflation in their administration is lowest compared to many or all previous administrations’ record over the past 30+ years. Also Thailand’s Prayut, Singapore’s Lee, Cambodia’s Hun Sen, Indonesia’s Widodo, and Vietnam’s Nguyen (see table). The acronyms for Philippine administrations are: Ferdinand Marcos (FM), Cory Aquino (CA), Fidel Ramos (FR), Joseph Estrada (JE), Gloria Arroyo (GA), Benigno Aquino III (BA), Rodrigo Duterte (RD). The proper comparison should be the inflation rate of the Philippines vs other countries over the same period and years, say from 2016 to 2018. Many countries’ inflation rates declined in 2018 despite the rise in world oil prices, except the Philippines and few other countries. Aside from credit grabbing of Dutertenomics, notice also its cherry picking of years. Why compare inflation under Du30 vs past five administrations only, why not six? Why did they skip the last six years of Marcos where inflation rate was nearly 20%? So that the Duterte idol of Marcos family won’t be upset? A few groups and former NEDA, DOF, DBM, BSP officials are producing statements blaming many factors for the high inflation rate – world oil prices, peso depreciation, “profiteering” by the private sector, "our own worst enemies" self-infliction, etc – but not TRAIN tax hikes. 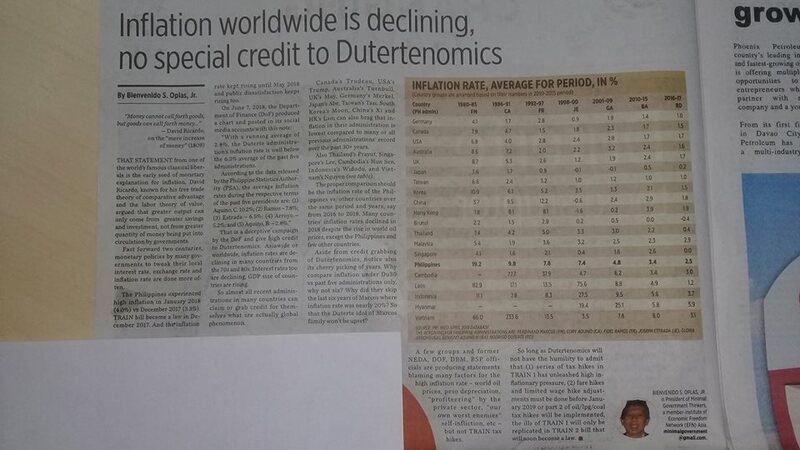 So long as Dutertenomics will not have the humility to admit that (1) series of tax hikes in TRAIN 1 has unleashed high inflationary pressure, (2) fare hikes and limited wage hike adjustments must be done before January 2019 or part 2 of oil/lpg/coal tax hikes will be implemented, the ills of TRAIN 1 will only be replicated in TRAIN 2 bill that will soon become a law. 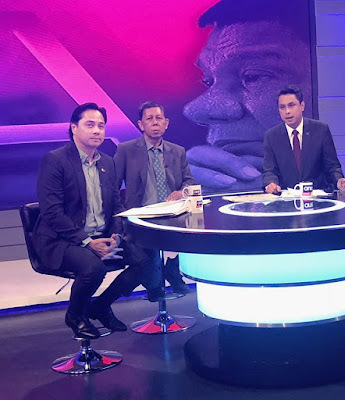 Last Monday, July 23, I was one of six guests in ONE News' special coverage of SONA 2018 by President Duterte, 3-5pm, hosted by Roby Alampay. The first three guests were Prof. Roland Simbulan of UP Manila, Jarius Bondoc, PhilStar columnist, and Prof. Go (?) of UP Political Science Department. They did political analysis of Duterte's two years in office. The second batch would talk about economic analysis of the administration's achievement, my turn plus fellow BWorld columnist Andrew Masigan, and the young UP Professor stayed with us. We were called in about 3:45 and right at that moment, there was a big drama in Congress -- former President and now Congresswoman from Pampanga Gloria M. Arroyo and allies went up the rostrum for her supposed election as new House Speaker. So the topic suddenly became political, a topic I don't want to talk on TV as there are many political commentators around more knowledgeable than me. But the earlier batch of guests, Roland and Jarius Bondoc have already left, so Roby must continue the discussion with two economists and the Political Science academic. It was a 1+ hour of semi-torture for me, hahaha. I did not speak much and before 5pm, I really wanted to be out, then luckily Jarius and UP Law Prof. Jay Batongbacal entered the studio -- what a relief! These guys can discuss the subject better, political and legal.